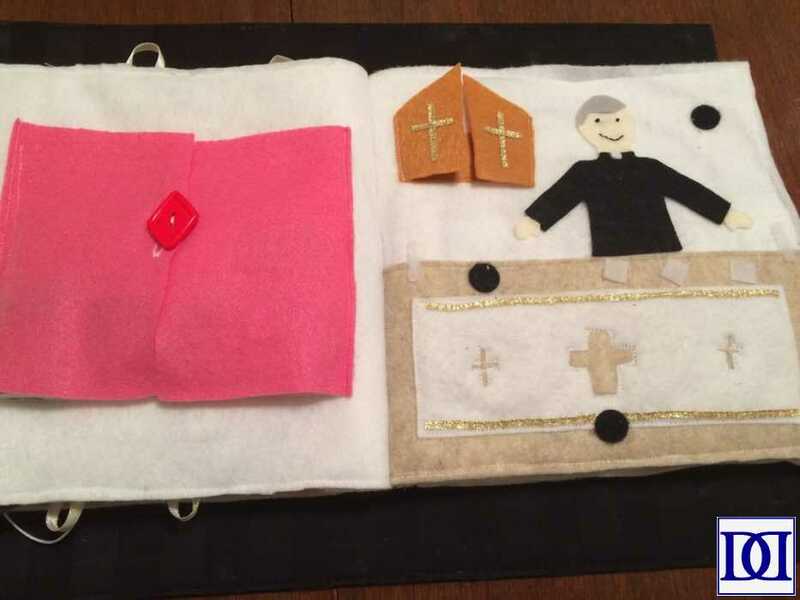 When board books and the contents of mom’s purse weren’t quite cutting it during Mass to keep our then 18 month old engaged, I decided to create a quiet book to help her (and my husband and I) remain calm during our weekly church services. After using it successfully for 3 years and another child, I decided to make a second, and they truly are the most valuable tools in our church bag arsenal! This page is probably the least religious of the book, but I felt it was a good staging for what the kids experience as part of going to church. 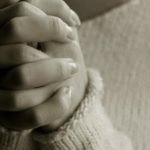 Occasionally, we’ll ask our kids questions like, “How are they making good decisions on their way to church?” “What do they see on their way that reminds them of God?” “What sort of music are they listening to?” The list is endless, and it’s a great way to begin encouraging self-preparation for attending service. 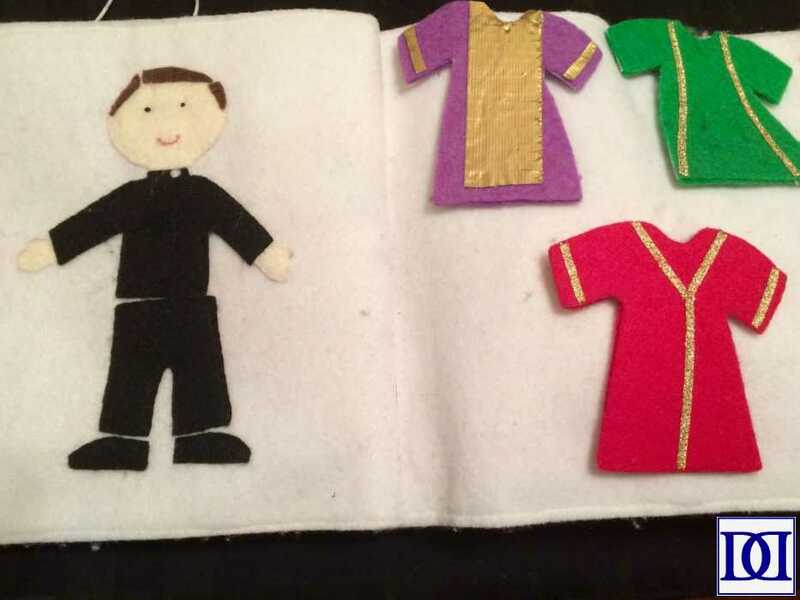 Our daughter was very curious about the different colors in church and especially the outfits the priests would wear. 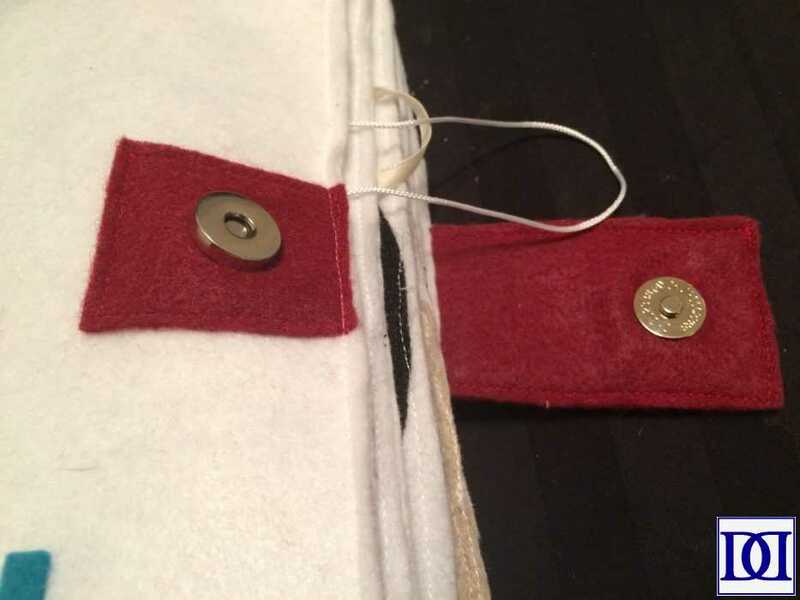 As such, we decided to devote this page to the different vestments donned by priests throughout the liturgical year. As she’s grown, we’ve been able to have a lot of fun conversations about *why* these colors are used during Mass and to look forward to the changing seasons together. 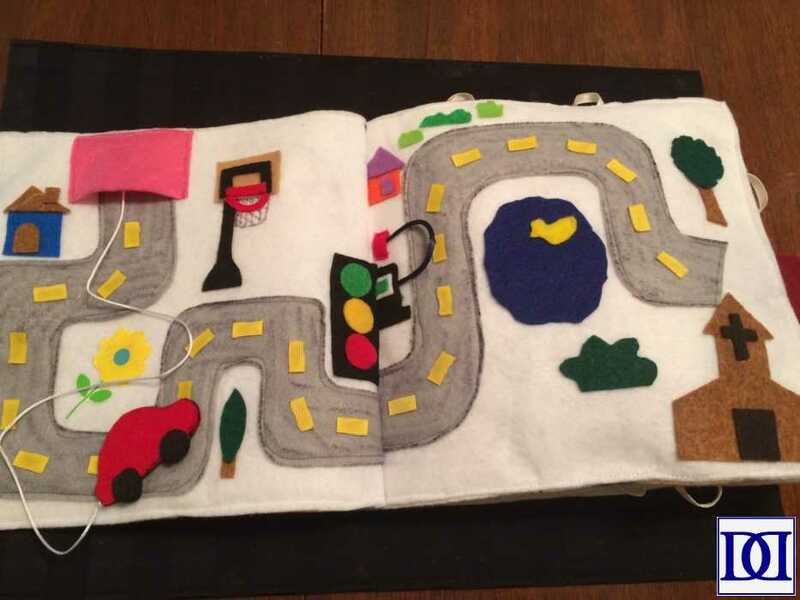 It also proved to be a good transition from the previous “driving to church” page as it highlights how everyone prepares for church in different ways. 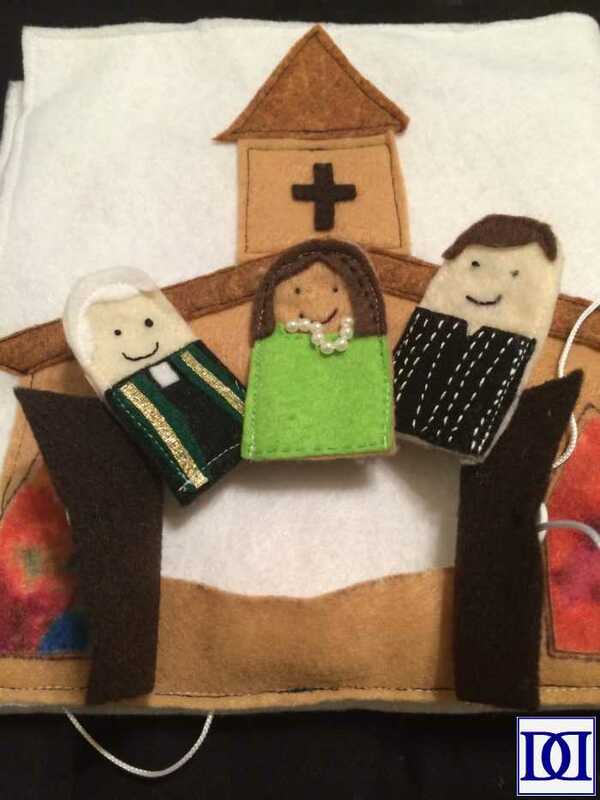 We’ve had a lot of fun playing with these finger puppets (they can “sing” the hymns with your family, play around the pews/kneelers, or they can “listen attentively” while precariously balanced on your toddler’s quivering fingers) in addition to arranging them into their pews. The altar page stemmed from a conversation that I had with our oldest about how beautiful church always looked. 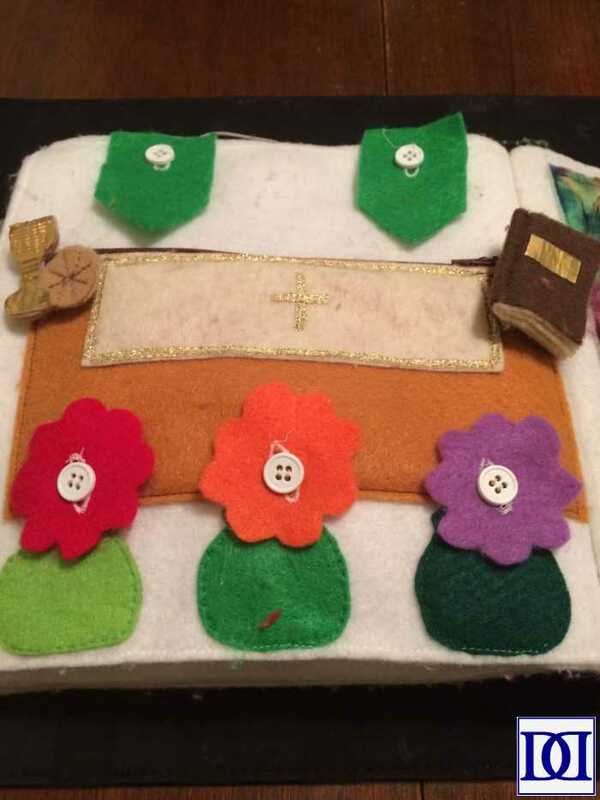 It became apparent to me that she didn’t understand what effort went into dressing the altar each week for church, and it dawned on me that she would thoroughly enjoy doing that in this book. 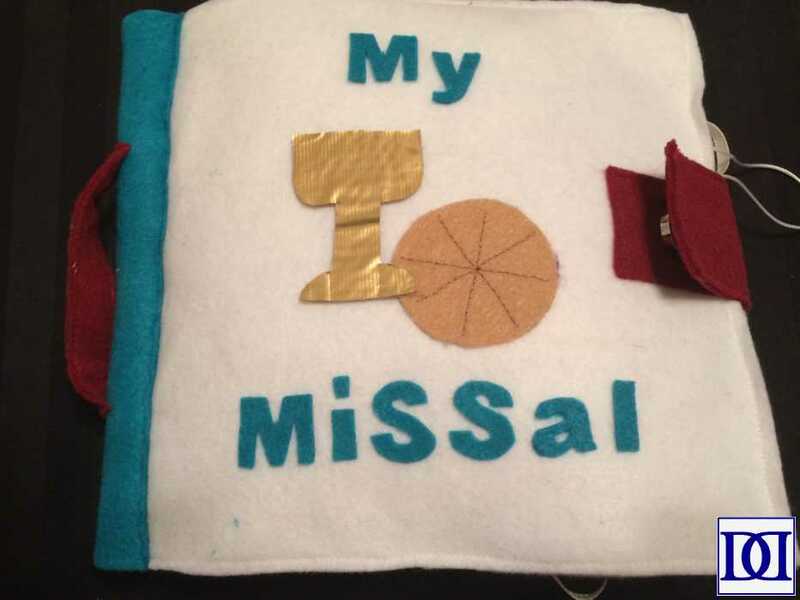 I included banners for the various colors in the liturgical calendar and different color flowers as well as a Bible (complete with embroidered “writing”) and the Eucharist/Chalice. While the buttons were a bit advanced at first, this page now fully engages her (at 4). The coloring page was a last-minute addition and has proved invaluable. This page is where their minds can run free (even if their bodies aren’t), and they can draw their thoughts, dreams, prayers, observations, etc. 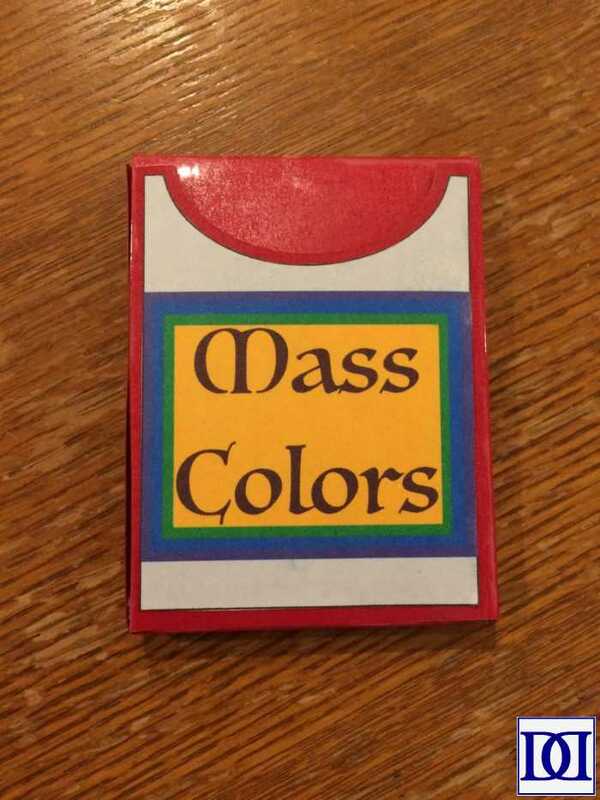 We only store a box of 8 crayons, so it’s not too much to keep track of during Mass. I also made this crayon box for them, and you can find my tutorial for putting it together here. 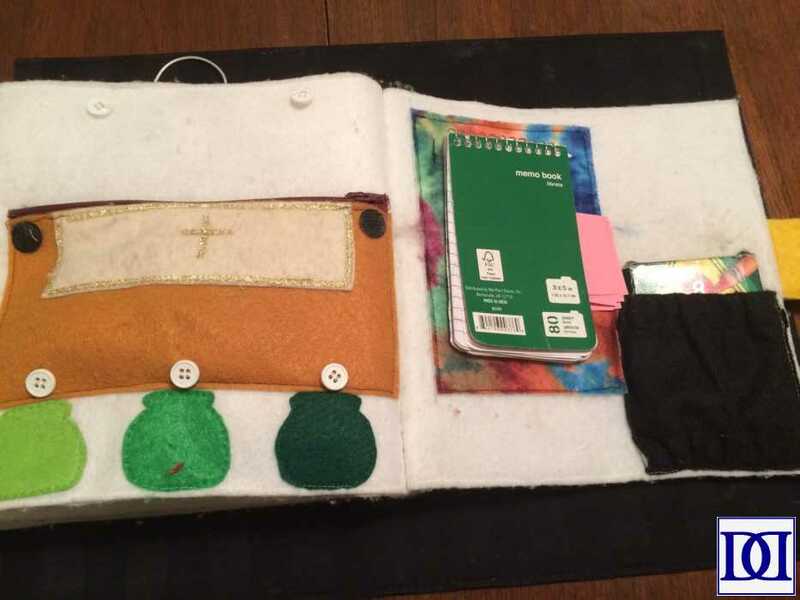 I decided to keep the books fairly similar (to avoid sibling disputes) but also to distinguish these books from future religious quiet book projects. 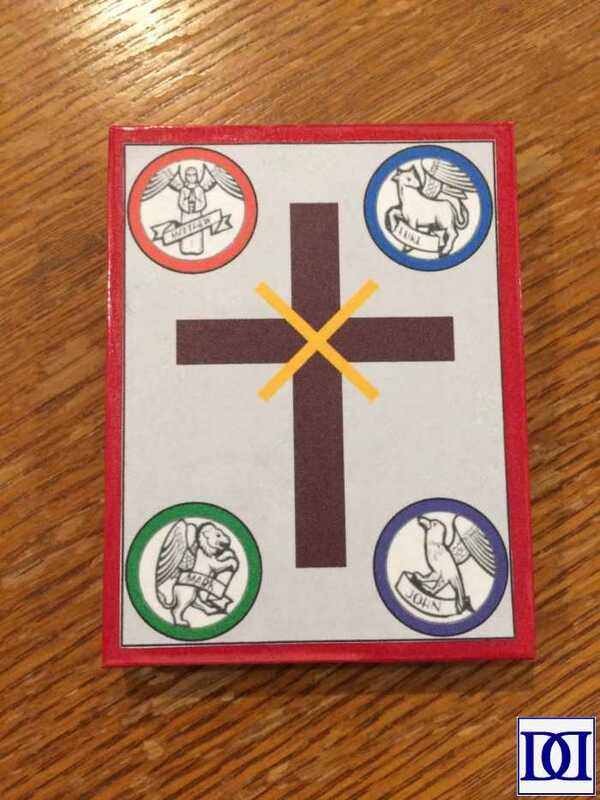 While my daughter was initially drawn to the cross in church, my son has been more intrigued by the Eucharist/Chalice (in our more cynical moments, we joke that this fascination stems from his single-minded interest in food, but there’s also a spiritual component that is very encouraging). 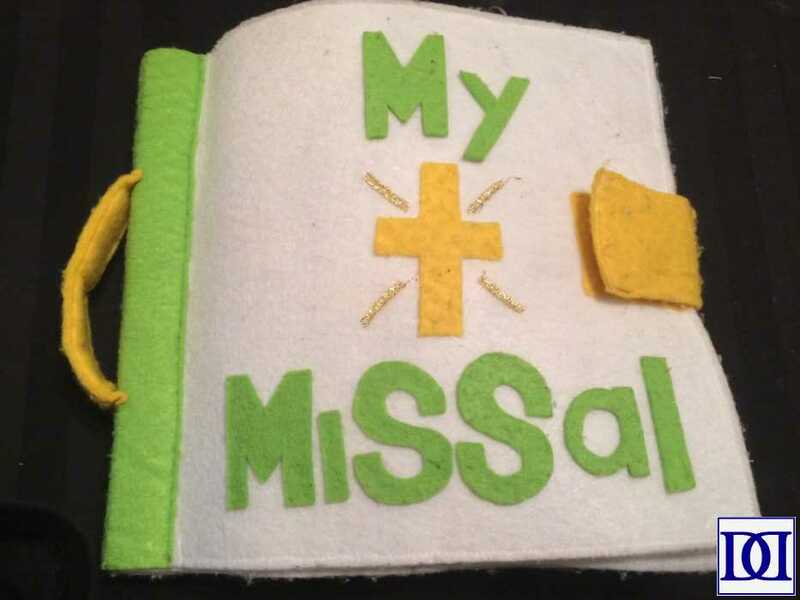 Just as in the Green Quiet Book, we wanted to give our kids a chance to reflect on the journey to Mass. 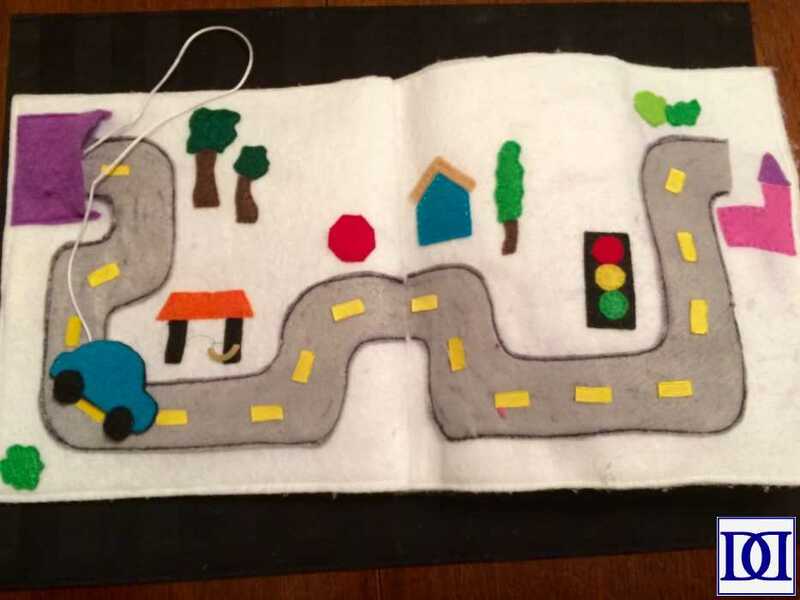 I added additional features to this page that reflect more of my son’s interests in the world (basketball hoop, duck, etc), but kept the basic features that I feel lead to a deeper discussion (traffic laws, gas for “filling up,” houses, nature, etc). 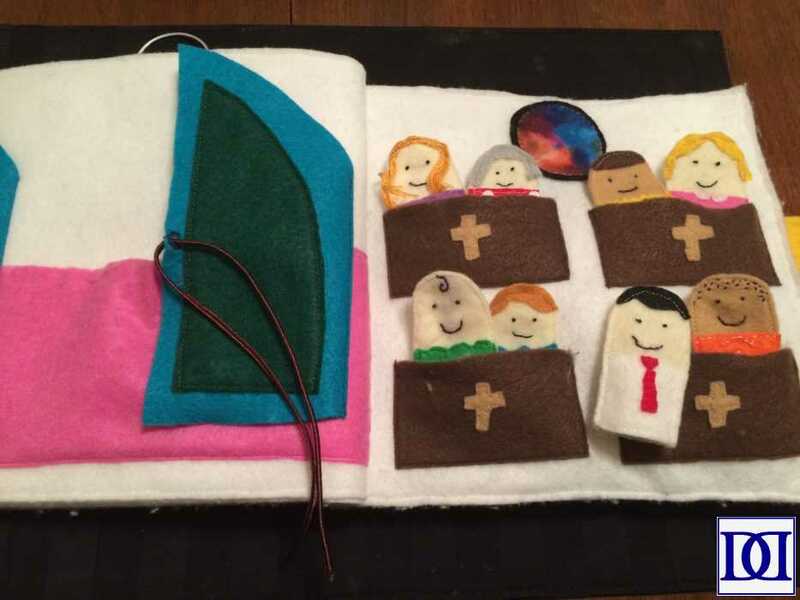 Since my son hasn’t shown an interest in organizing the people in pews (as our daughter did in the Green Quiet Book), I decided to simplify this page for the second iteration of the Church Quiet Book. It still flows from the previous page as people preparing to enter the sanctuary, but it allowed room for me to be creative on the next page. The stained glass window was inspired by our daughter and her current interest in puzzles as well as my son’s enjoyment of the windows at our church. I managed to keep the pieces connected with ribbon (secured under the frame of the puzzle), which is also helpful in putting the somewhat complicated puzzle back together. 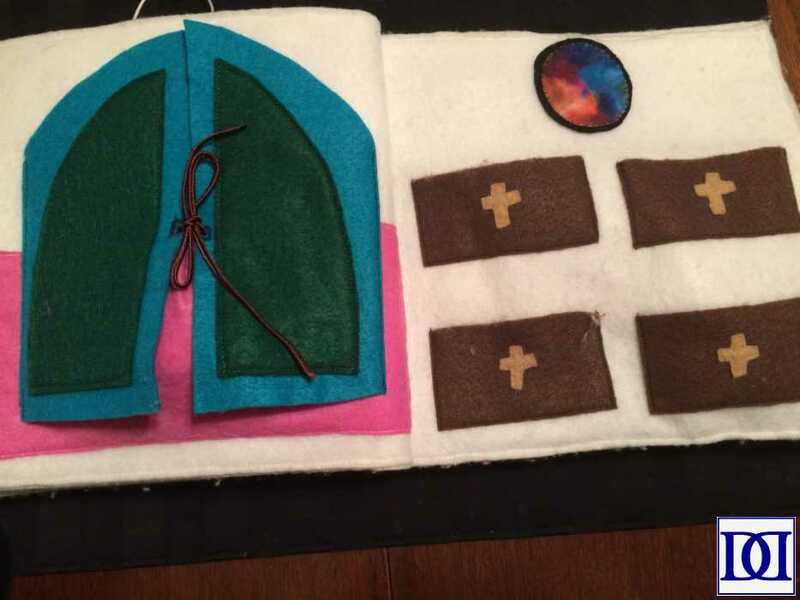 Given how successful the altar dressing and priest vestment pages have been in the previous book, I wanted to use them again here, but chose combined them so the kids can dress the entire scene at once. I also wanted it to begin as bare as possible to be functional for services like Good Friday. 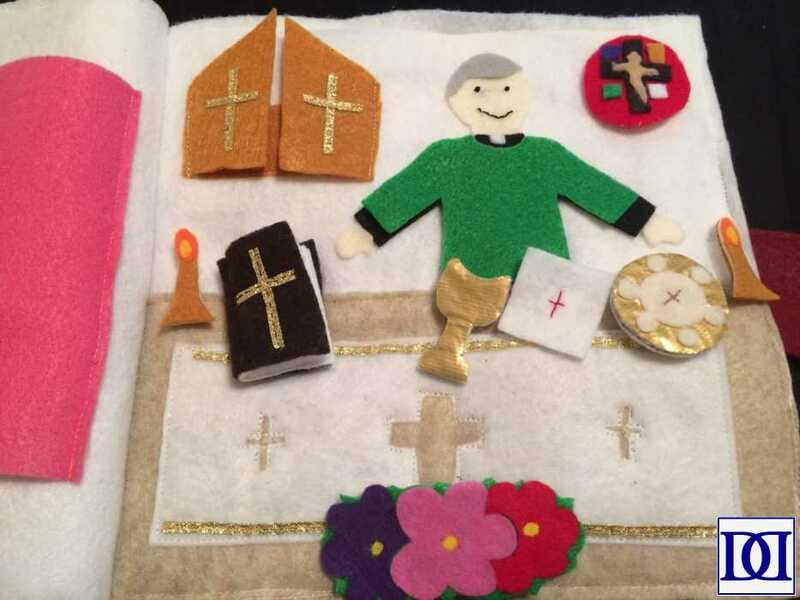 After doing some more research into what “belongs” on an altar, I was able to give this page a bit of an update with candles, a crucifix, and cloth that functions as the altar linens. 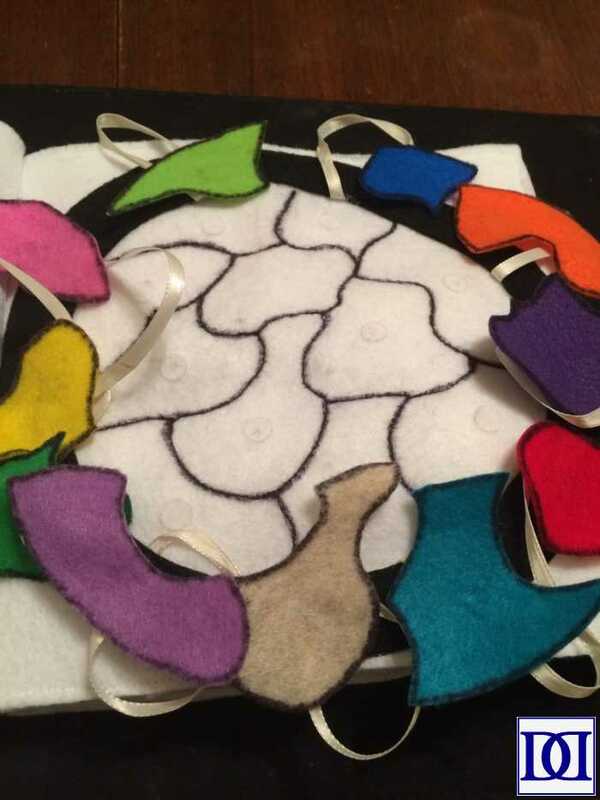 After Lent 2016, my daughter became very interested in the labyrinth as a way to pray while engaging the body (she also thinks the design is very appealing). 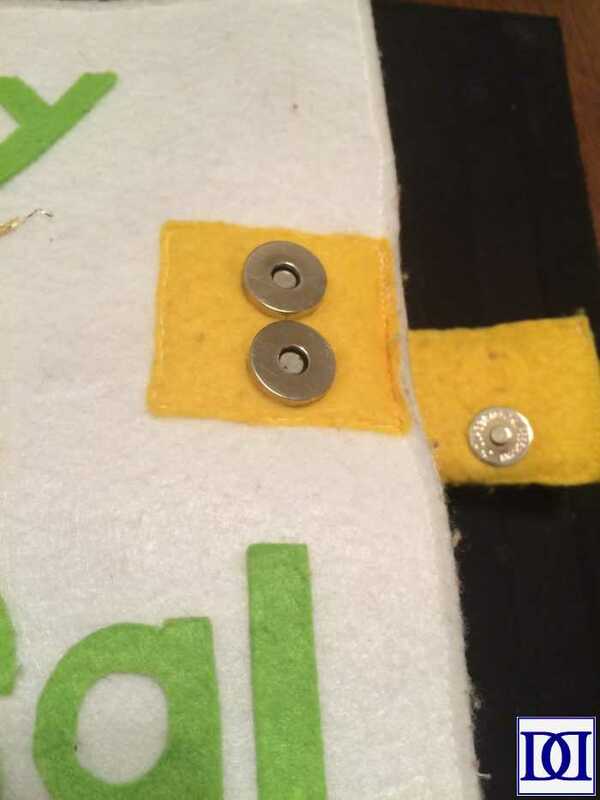 My son enjoys fine motor activities, and will often spend long periods of time manipulating small objects through an obstacle course of his own making. 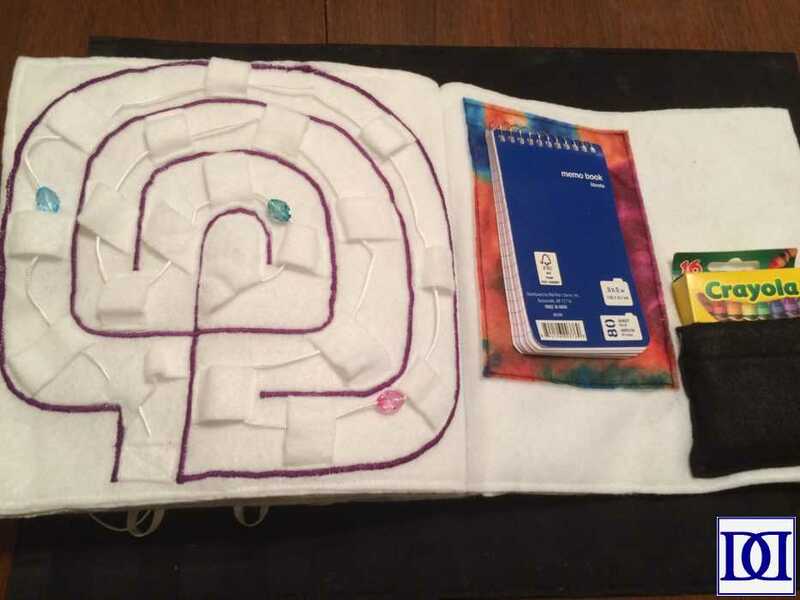 Putting these two qualities together, I created this page, which is a bead maze in the shape of a labyrinth. Finally, the coloring page, which is exactly the same as the Green Quiet Book. Since this page is, by far, the most popular for both kids in the previous book, it was the only guaranteed page that needed to be included in the next (and all subsequent) iterations of this book. I also made this crayon box for them, and you can find my tutorial for putting it together here. And that’s it!!! 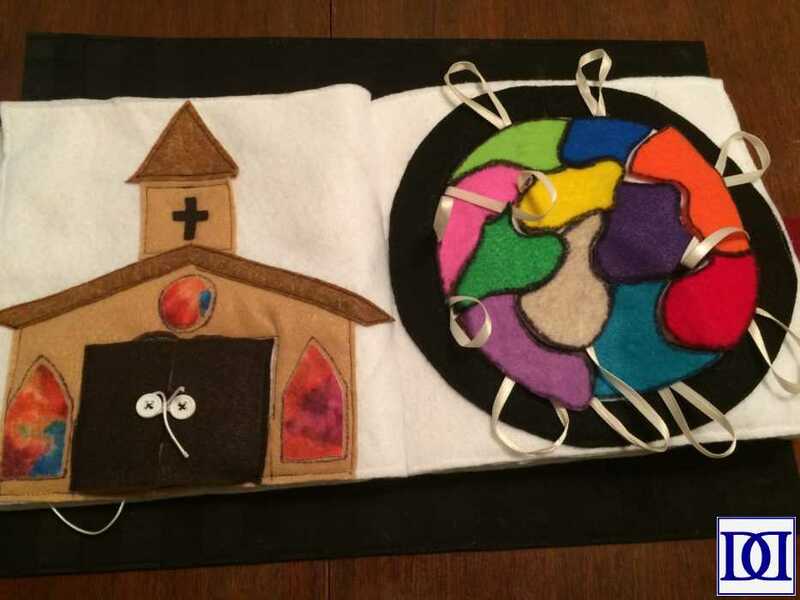 While these books are a definite labor of love, they are also very functional and educational for young children in church and are serving their purpose well in our family. 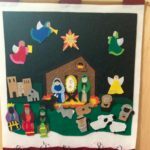 What a unique and great idea, especially in how each draws the child into the liturgy. you could market these, Ann, if there was a way to mass produce what I know was hours and hours of planning and implementation. Beautiful idea! These are amazing! You are very talented Anne!